As far back as the late 1700s, the Brugerolle family were farming the vines, producing eaux-de-vie and beginning to supply their products to local businesses. The founder of the cognac house, Leopold Brugerolle, not only supplied restaurants around the country – including those in Paris – but also found his cognac being requisitioned by French military officers. 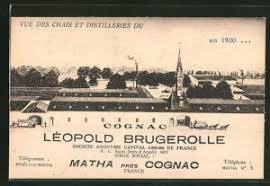 By 1847, Cognac Brugerolle had established itself in Matha, Charente Maritime, and continued to produce a wide range of cognacs. The house was passed down through the generations, along with the secrets and traditions of each cellar master from father to son. In 1987 the house of Cognac Brugerolle was incorporated into the Compagnie de Guyenne (CDG). This is the collaboration created by Meukow Cognac, which along with marketing their own cognacs, concentrates on sustaining smaller, family run cognac houses and providing them with the distribution network and might of a larger corporation. The Cognac Brugerolle House creation dates back to 1847 by Etienne Brugerolle. Today, Mr. Claude Brugerolle, 5th generation and Vice-President of CDG International is perpetuating 166 years of tradition. The fame of Cognac Brugerolle is coming from the meticulous and precise selection and blending of the best eaux-de-vie. As a proof, the 45 awards won by the Cognac Brugerolle at many international contests: First prize in Athens 1928, Rotterdam 1928, Cairo 1929, Barcelona 1929, Liege 1930, Antwerpen 1930, Paris 1931 to be seen in the old buildings in Matha city. More recently in 2005, their Aigle Rouge quality was awarded a Gold Medal at the Paris Vinalies an international tasting competition. Situated in the Fins Bois area, Brugerolle Cognac blends the region's fruity eaux-de-vie along with those from Grande and Petite Champagne. The result is a range of "Premium Cognacs" offering their customers traditional and authentic Cognacs with a beautiful lengthy aroma, subtle fruit and wood flavors enhanced by a floral bouquet. A wide range of consumers can enjoy this Cognac.